Simple Kind To Skin Purifying Cleansing Lotion contains the perfect blend of ingredients to gently cleanse drier skin. This facewash helps keep skin smooth and softened. Made with the perfect blend of gentle cleansers, multi-vitamins and skin loving ingredients. This face cleanser contains no artificial perfume or colour and no harsh chemicals that can upset your skin. Our facial cleanser is suitable for all skin types, even the most sensitive skin. This face wash is non-comedogenic, hypoallergenic, dermatologically tested and approved. Love the feeling of smooth, softened skin? 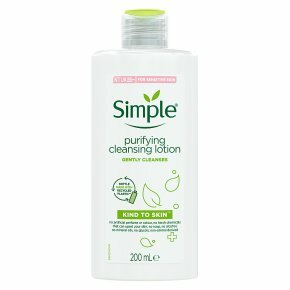 The Simple Kind to Skin Purifying Cleansing Lotion is ideal for gently cleansing drier skin; with its creamy no-rinse formula, this cleansing lotion makes the first step in your skincare routine quick and easy. Just apply the product to cotton wool and sweep over your skin using upwards and outwards movements; this helps to avoid pulling your skin downwards as you cleanse. These little skincare tips can all contribute to skin feeling happier and healthier! Our Purifying Cleansing Face Lotion is also ideal for taking with you on-the-go as there's no need to rinse it away, which is why you'll find it in both our bathroom cabinet and travel beauty bag. Cleansing your skin daily is essential for helping to clear away dirt and bacteria, but it's important to not overdo it ? overusing skincare products can actually trigger skin sensitivity. Cleansing twice a day with a gentle cleanser like the Purifying Lotion Cleanser is ideal, and the perfect way to start your morning and evening beauty routines. After we've cleansed we love to apply our favourite Simple moisturiser, like the Kind to Skin Replenishing Rich Moisturiser, to nourish and replenish skin for up to 12 hours. Like our Purifying Cleansing Face Lotion, it is great for dry complexions, and makes for the perfect sensitive skin cleanser. For additional convenience, try our Simple Cleansing Face Wipes while on the go!